San Francisco, Calif.-It was over 25 years ago. And it was arguably the most significant new car model launch — well, maybe ever. Could Toyota really build a car that could compete with the best the Germans, Brits and Americans could offer? The original Lexus LS 400 may have been a dead-nuts copy of the previous-generation Mercedes E-Class, and Toyota’s long-term pricing strategy allowed it to undercut the competition by tens of thousands of dollars. But the cat was definitely amongst the pigeons. It soon became clear that, at least from a quality and refinement standpoint, RoW (Rest of World) had some serious Japanese competition. The fifth-generation LS, now dubbed LS 500 in today’s “model names mean nothing anymore” world, plans to re-energize this offensive. It goes on sale in the first quarter of 2018. Pricing has not been announced. The current LS has a base list of $94,600, less a $10,000 rebate, but that’s not much of a guideline because that’s for the short-wheelbase version, a model Canada will not get in the new generation. The long wheelbase LS currently lists at $130,740, less the ten grand rebate, which seems like a huge hit for an extra 120 centimetres of wheelbase. Given that the current Mercedes-Benz S-Class, still the benchmark in the luxury sedan class, starts at $106,400, I expect the new Lexus will start somewhere in the low-$100k range. The new LS faces a somewhat tougher task than its progenitor. The other luxury carmakers have upped their games qualitywise, and Lexus can no longer afford semi-predatory pricing. So, Lexus has decided to take the game to them, with an all-new car with original styling, some interior features the Germans cannot match, and better handling than any previous luxo-Lexus. This thanks to an almost-all-new platform, a stretched version of that used in the SC 500 coupe. Longer, lower and wider are the keywords; add ‘lighter’ to that, as extensive use of high-strength steels and aluminum have carved some 90 kilograms out of the structure. Two engines will be offered in our market, not surprisingly given it’s a Toyota/Lexus, a 3.5-litre V6 hybrid, revised from what the former LS had, and significantly surprising, an all-new twin-turbo 3.5-litre V6. Surprising? Yes; no V8 engine in the new LS, which would seem to put it at a competitive disadvantage with the competition. And, the two V6s share approximately zero parts. Lexus feels that with 415 horsepower, the twin-turbo V6 will deliver performance that will more than satisfy, with better fuel consumption than a V8 could muster. The hybrid, despite having less power — a total of 354 horses from the gas engine and two electric motors — is expected to be the ‘premium’ engine. Funny how Lexus believes fuel consumption trumps performance, even in six-figure cars. Both engines will return 0-100 km/h times in the mid- five-second range, although it must be noted that the Mercedes-Benz twin-turbo V8 pulls off that trick about one second quicker. A 10-speed automatic is the only available transmission in the twin turbo, while the hybrid gets Lexus’s complex multi-unit transmission which gives the effect of 10 forward ratios. Full-time, four-wheel drive will be standard fitment in Canada, which also means four-wheel steering will not be available as it is incompatible with four-wheel drive. But to further extend the metaphor, the game has moved on, and so has the LS. Sport mode firms up the suspension (both my test cars had the available air suspension), quickens the throttle response, and tightens the steering. You can also select settings individually for the three parameters. Depending on the condition of the road, I vacillated between Sport and Comfort for the dampers, but preferred the steering to stay in Sport, for crisper response. At all times, the car was almost uncannily quiet. But the ride quality is let down by the run-flat tries. Of the two engines, I preferred the twin-turbo over the hybrid. Power delivery was more linear, with turbo boost coming in at low revs and staying with you as you approach the red line. 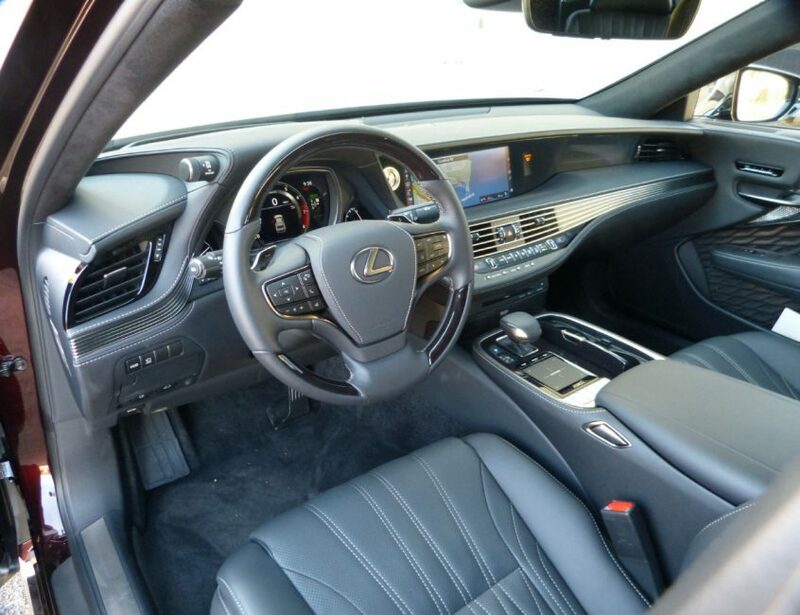 Lexus has long been known for sumptuous interiors, and the new LS is no exception. What’s more, it reflects Japanese artistry rather than trying to be fake-German. ‘Takumi,’ a Japanese word that literally means ‘artisan,’ describes the impact they were looking for inside the car, resulting in such delights as scroll work on the door trim panels and dashboard. The front seats are multi-adjustable, and I found them comfortable and supportive, although they are huge, which takes away some of the rear seat space. You can even order adjustable rear seats which almost fold down into a bed. Perfect for those long commutes when your chauffeur is driving. What? You don’t have a chauffeur? There is so much technology in this car that I have barely scratched the surface. 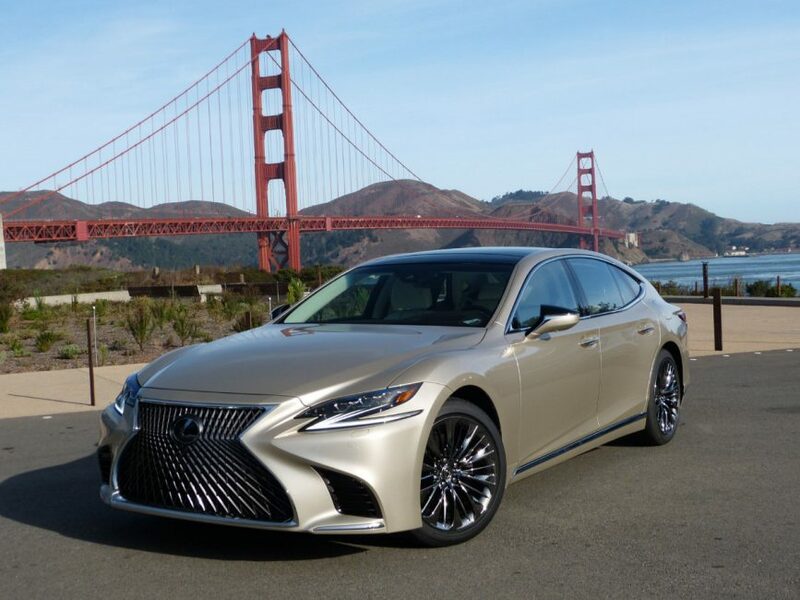 Suffice it to say that if you are in the market for a luxury sedan, even if your tastes have generally run to German, British or even American cars, the new Lexus LS 500 and LS 500h deserve a very close look. Lexus LS 500 / LS 500h: 4-door, 5-seat luxury sedan, full-time four-wheel drive. ENGINE: 3.5-litre V6, double overhead camshafts, four valves per cylinder, variable valve timing, twin turbochargers / 3.5-litre V6, double overhead camshafts, four valves per cylinder, variable valve timing, two electric motors. POWER/TORQUE, horsepower / lb-ft: LS 500 — 415 /442; LS 500h (total system output) — 354 / n/a. TRANSMISSION: 10-speed automatic with paddle shifters / multiple planetary gearsets to create the equivalent of 10 ratios. TRANSPORT CANADA FUEL CONSUMPTION, City / Highway (L/100 km): n/a. Premium fuel. COMPETITION: Audi A8; BMW 7 Series; Mercedes-Benz S-Class. WHAT’S HOT: Gorgeous interior; comfortable seats; extremely quiet; better handling than previous generations. WHAT’S NOT: Performance not quite up to class standards; rear seat room slightly compromised; run-flat tires still not ready for prime time. WHAT’S INTERESTING: The least powerful model is the most expensive — is this how people in this snack bracket really play?